Spoilt for choice, but the beats are alive in this city!! Last edited by TheOperatives on Wed Jun 02, 2010 9:50 pm, edited 5 times in total. so if melb has the capacity to run weekly gigs for this mix of genres... does that suggest that collaboratively we could fill a weekly nightspot aka superclub?? :O find your own headliner from now on! tbh i don't know that it does, but i guess we'll find out. and yes next few months are stupid, big ups every one talking so we all new what was happening. 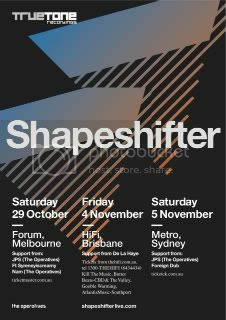 EvilSnakeWoman wrote: so if melb has the capacity to run weekly gigs for this mix of genres... does that suggest that collaboratively we could fill a weekly nightspot aka superclub?? dont agree. same venue each week gets tired real quickly. diversity is the key. diversity of acts. diversity of venues. diversity of crews. its what fun is made of. He's climbing in your windows, he's snatching your people up. i going to this. day after my current project finishes. wooootles mcboootles i say. Mm ok MrJ, but 2 outta 3 aint bad – diversity of acts & diversity of crowd. don't forget about all the kids who don't know who in the world "calibre" is,, but likes to drink, dance and socialise..
Foo >>> yep ur right. but can we get numbers from all crews to know the current capacity is next question? Same venue each week is a total loss. Smaller crews would just start doing parties at other venues and you loose some of the regulars and your capacity is diminished. wow. that's pretty goddamn impressive. couldn't have picked a worse time to leave. Scene needs a local superstar tbh. awesome list we got going on. who said winter is for hibernating? i like too many genres, that list only covers part of my musical tastes. fark. so DBoy>> what do u recon would need to be done to help maintain capacity at the same time as respect & encourage the smaller UG crews to grow? jamesss >>> oooh local superstar would be cool... maybe a sponsored dj comp similar to DMC but for DnB/DubStep/Grime/Glitch/FGarage DJs? affiks is not a superstar dj?????????????????????????? That's not really what I meant! I mean a local DJ/DJs who punters will be as excited / more excited to see than an international despite the fact they might be seeing them every week. They seem to pop up from time to time. Boogs is a good example from another genre I suppose. i'll be a local dj hero but i'll need to charge international rates keke? kiss & tell wrote: i'll be a local dj hero but i'll need to charge international rates keke? you would not be the first. JAMESSSS wrote: That's not really what I meant! Yeah I don't think it will either. If it does they should have a cape. great to see a list of things to do, would it be a stupid idea if someone could make an iphone app that promoters could log into & update events, fliers & bookings? Anything out there close to it? iPhone Apps a great idea Rainer! any u jokers got real ideas? meltdown wrote: great to see a list of things to do, would it be a stupid idea if someone could make an iphone app that promoters could log into & update events, fliers & bookings? there is such apps. i got offered one recently. however, they are for one venue/promoter only to use, not a full linked calendar of events. you pay quite a bit to set it up, you would want the majority of the population to have Iphones before doing that! so Fail, in my mind. You are missing my point. But I do agree there are lots of good DJs. not worth it for the actual number of people with iphones. 1. iPhone APP - Musician/DJ/Producer. 2. iPhone and Android APP- Musician/DJ/Producer. 3. iPhone APP- Labels, Venues, Events, MGMT and Agents. 4. iPhone and Android APP- Labels,Venues, Events, MGMT and Agents. 5. Added Value - Push Notification one time setup fee. So if Cubist absalutely blows up in Europe while away. Lays down some tracks with some names, gets picked up by Metalheads and starts being named up top on fliers with UK players who we call stars here as support - then can we call him a local superstar and get excited about going to see him play? Please note tounge inserted firmly in cheek. pretty sure they are actually. Looking at the list and wishing I could go to 80% of those gigs, not 10%. Great to see so many awesome gigs coming up and yes we are spoiled this year. For those of you who have ideas, put your money where your mouth is and do it yourself like the guys who are putting on the gigs mentioned in the list above rather than tell everyone else what to do and how it can or can't work.Simple. Big ups Operatives, Too Much, Heavy Innit & BBA for putting on quality gigs over the last few years! Nam >>> more than happy to do the research if people are willing to provide data. 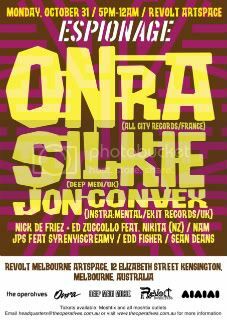 Would need support of operatives, bba, basshigh, wobble, subbass, heavy innit, smashbros, glitch this, twisted edge, kiss and tell..
by Melbourne's own custom built sound machine, crew and friends. 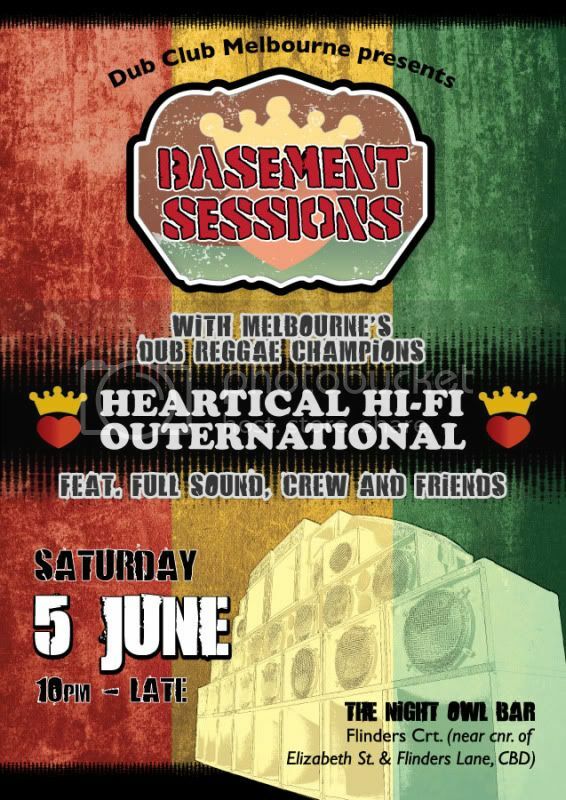 The International connection between Dub Club Melbourne, Rising Lantern Records, Italy’s B_Team and Bio_(L)oGIC proudly presents for the first time in Australia from London UK, DJ Souljah and Peter Bouncer. Live and direct on Melbourne’s own custom built, high powered sound machine- Heartical HiFi. Across two rooms at Roxannes Parlour this one away night of bass flavored niceness not only celebrates Jungle, Dub, DnB, Reggae and Dubstep but also the earthday of His Imperial Majesty Emperor Haile Selassie. Get ready as the original Jungle ambassadors DJ Souljah and Peter Bouncer perform an exclusive three hour set supported by special guest Sberla 23 from Milan alongside Stryka D, Boover Banton, Folklaw, AC23, Spin FX, Finna, The Nomad and J Don. All ingredients added to make a great night to satisfy all tastes of bass cultured music. Hold tight! ok, added more dates and stickied this!